Scrum is a popular software development management infrastructure that responds to the customer demands quickly and ensures the production of flexible and high quality software. The purpose of this training is to convey the foundations of Scrum to the participants practically on sample project, and ensure that the participants gain knowledge about Scrum. Everybody developed an awareness of Agile. We understood that the jobs we did can also be done in some other way-. This made us question how we can we do our job in a better and simpler way . Another gain was start of establishment of the value-oriented perspective while realizing the projects ACM guided us on how the transformation can be done. Click to read more. I had prejudices about Scrum when I attended the Agile Project Management and Scrum Management, then I got rid of my prejudices with through training. I think it’s the philosophy that best emphasizes the importance of being a team. 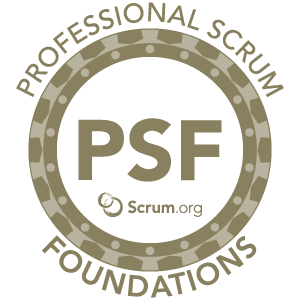 Holders of PMP certificate now earn 14 PDUs from the 2-day Professional Scrum Foundations Training. You will prepare for the PSM exam I (Professional Scrum Master I) certification, one of the most important certifications in the field of Agile and Scrum. In order to implement Scrum successfully, Scrum infrastructure needs to be first understood To that end, the participants will progress by actively implementing Scrum in a project as a team throughout the training, an acquire knowledge on the following topics. Scrum Infrastructure: Scrum, the roles and responsibilities in Scrum, rules, principles, meetings, feedback and control mechanisms, outputs. Scrum & Agile: Foundations of Scrum, place and current position of Scrum within Agile, the value brought by Scrum, increase of productivity, and ‘self-organization’ practice in its foundation. Planning in Scrum: Product Backlog management, Release planning, planning the Sprints, being able to express the project requirements effectively, creation of the Tasks. Healthy Continuance of Scrum: Mistakes likely to be made in Scrum adaptation and transition process, ways to avoid such mistakes, other difficulties that may be encountered in the adaptation process. Starting Scrum: Steps to put Scrum in place following training. International Certified Agile & Scrum Training is intended for all the organizations which are seeking to improve their existing software development processes, wanting to gain knowledge on Scrum, or implementing Scrum. Business analysts, software developers, software architects, testers, project managers, information processing managers and all other information processing employees can participate in the training. There is no precondition for attending this training. In the Product Backlog Management Training I participated in, I saw many processes that are being wrongly implemented . I got an idea about the critical points in Backlog management and management of Scrum teams. We received the training 1.5 year ago with the entire IT team. The training met our expectations, it conveyed us the necessary knowledge and mindset to start the process change. I had previously participated in the Scrum training organized by another educational institution . While the things told in the training sounded very logical, I had a lot of difficulty in putting into practice what I learned since no information was given on how Scrum can be implemented in real life. Thanks to the ACM training I participated in a while later, I learnt from end to end how Scrum should be implemented in a project and the errors frequently made during the implementation. Now, I can recommend implementing Scrum in all our projects to the management without hesitation.